CHAMPAIGN, Ill. – Call it a Tanner Lee breakout game. The much-maligned signal caller had his first interception-free outing since the season opener when he accounted for 246 yards and three scores on 17-of-24 passing for Nebraska (3-2, 2-0 Big Ten) in a 28-6 win over Illinois (2-2, 0-1 Big Ten) on Friday night. Make no mistake, Lee got plenty of help. The offensive line gave him, for most of the evening, a clean pocket to work in and at times, Lee looked more comfortable than he has at any point this season. Wide receivers Stanley Morgan Jr. (96 yards) and De’Mornay Pierson-El (94 yards) each had big games through the air to help Lee. And the running game, led by junior Devine Ozigbo (18 carries for 106 and a score) and junior Mikale Wilbon (13 carries for 60 yards), was effective for a second straight week and was able to bleed the clock and wind down the Huskers' second straight victory. But for the most part, this was a badly-needed bounce-back game from Lee, who had thrown three pick-sixes in his last two games. He missed a few times, made a poor decision on a forced ball into coverage in the third quarter and took a few hits, but Lee threw the ball away a number of times. That might not seem like much, but it showed a mentality that had been absent in Lee’s game leading up to the evening. Live to play another down. When Lee faced pressure, he checked down or threw it away rather than forcing balls into coverage with blind faith in his receivers. On the other side of the ball, the Huskers’ defense was outstanding. The Blackshirts held Illinois out of the end zone and sacked Illini quarterback Chayce Crouch five times. Linebacker Chris Weber led the charge with nine total tackles (two for a loss), a sack and his first career interception, but redshirt freshman Ben Stille had a breakout game all his own with three tackles for loss and a sack. Illinois had just 106 yards through the air, 199 yards total and struggled to sustain drives late in the game. After a 12-play, 46-yard drive to open the second half, Illinois failed to stay on the field for longer than four plays the rest of the night. 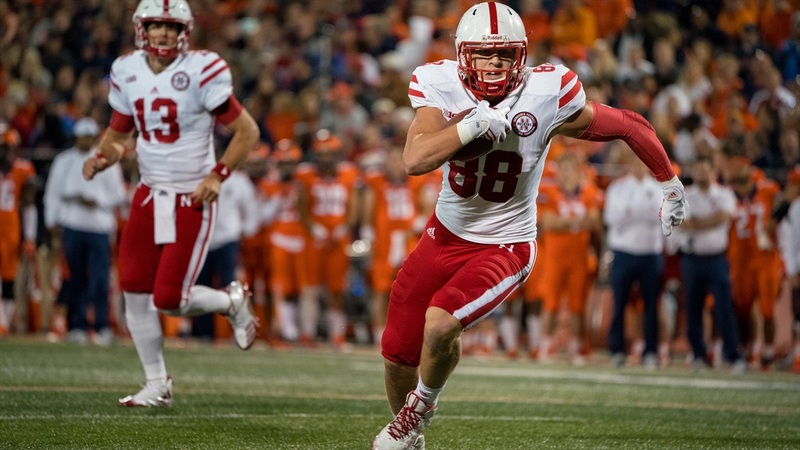 For the Huskers, it’s on to prepare for West division rival No. 10 Wisconsin (3-0) and an Oct. 7 meeting at Memorial Stadium.